When Michael Schade thinks about his potential audience, he thinks in millions. In fact, he thinks in tens of millions; that's the number of people with a stated interest in "space games" on Facebook, and that only includes those in Western markets. We are sitting at a table in the Games Industry Conference in Poznan, Poland, and the CEO and co-founder of the Hamburg-based developer Rockfish Games is walking me through a detailed, intricate method of finding new users through Facebook. Image composition, balance of colours, time of day, subtlety in copywriting; myriad factors are altered and tested, positive trends are pursued, and money tactically invested to reach, with certain ads, as much as 1.5 million people at a time. Space games in the broad sense, he says, have an audience of 100 million fans on Facebook. Schade doesn't expect 100 million players for Rockfish's own game, Everspace, but at a time when many indies see success as a roll of some invisible dice, Schade has found no end of encouragement from the precise targeting and visibility possible through platforms like Facebook. "It was a relief," he says, recalling the moment he discovered that Everspace's "peer group" of games had a fanbase roughly equivalent to the population of Egypt. "It was like, 'Okay, maybe we can sell a few more.'" "We were trying to keep that core team while adapting to free-to-play, and that didn't work. 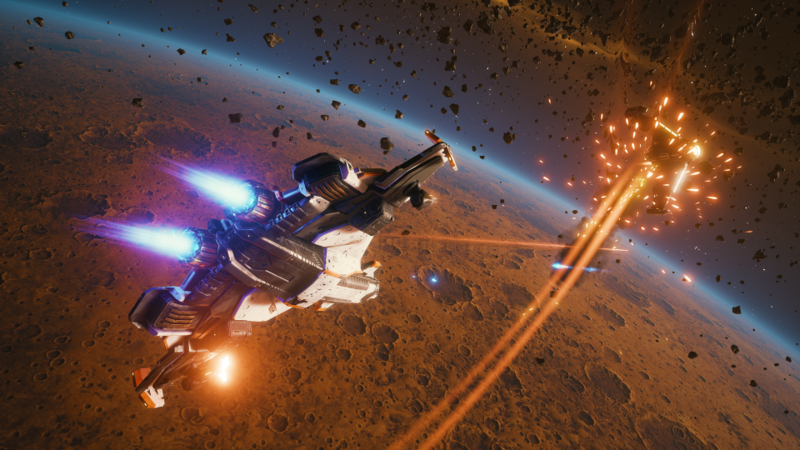 At the end of the day we had to start from scratch"
In truth, Rockfish has already sold plenty of copies of Everspace; upwards of 400,000 units at the last count. How it got to that position - one of comfort and stability for a studio with less than 20 employees - is an object lesson in how to set realistic goals and build an audience in the modern digital games business. Rockfish was founded by Schade and his business partner Christian Lohr in 2014. They had previously been the executive team in charge of Fishlabs, a studio that made a splash in the early days of the mobile boom with ambitious, highly polished titles like the Galaxy on Fire series. The studio was ultimately acquired by Deep Silver at the end of 2013, but not before it faltered in trying to keep pace with the mobile market's shift from premium to free-to-play. "I failed to raise another funding round, because the expectation was, 'Does this game have the potential to make $500,000 a day? 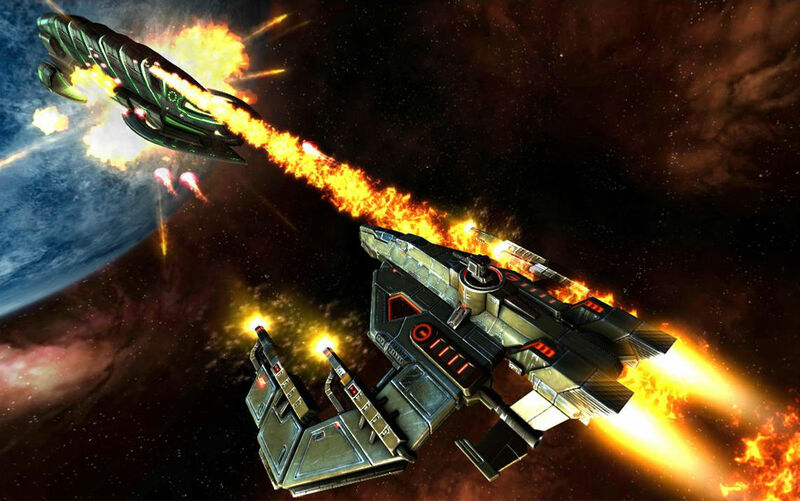 '," Schade recalls of seeking more financing for Galaxy on Fire's freemium debut, Alliances. "I was telling all of those guys, 'We'll be happy if it makes $500,000 a month.' So they said, 'Sorry we're not interested. Finish the coffee, take the cookie, on your way.'" As a handful of enormous free-to-play hits started to emerge, the commercial expectations of investors rose to unrealistic levels. "Theoretically, if you work with an investor you do have the creative freedom, but the problem is that being successful in the way that they define successful means following certain rules," Schade adds. "Which is why a lot of those games are pretty similar... You have a couple of genres that work very well in free-to-play, that are very successful, and then you have a lot of people who try to replicate that." Schade and Lohr left Fishlabs "without a dime" to show for their ten years at the company, but they did leave with one very important thing: a clear plan to start a new studio that would target PC and console, platforms where premium experiences were not regarded as a form of commercial suicide. A number of Fishlabs' core team, who were also disillusioned with the move to free-to-play, followed along. "That was our DNA. That was us. That was our team," Schade says. "We were trying to still keep that core team while adapting to free-to-play, and that didn't work. At the end of the day we had to start from scratch. And you know what? In retrospect, that was the best thing that could have happened to us, because we're now back in the game, and we're doing exactly what we like doing, exactly what we're passionate about." As a visually striking space game, Everspace was very much an example of a team sticking to its core strengths. However, no sooner had Rockfish started pitching than the differences between mobile and PC/console became disarmingly clear. Fishlabs had built its reputation on making polished mobile games in classic PC and console genres, Schade says; it was now in the same market as the people and companies that had been working in those genres for decades, the same market that already had Elite: Dangerous, and was eagerly awaiting Star Citizen and No Man's Sky. "We pitched it to all of the big guys at GDC 2015 and E3 2015. They liked it a lot. Everybody passed," he says. "They saw the game, they liked the quality, and they knew because of our Galaxy on Fire history that we would be able to deliver a great space shooter. But all the publishers, pretty much, turned us down or passed on the opportunity because, A, there's no multiplayer. And my impression was that publishers were at least not familiar with the roguelike genre. The producers were, and the producers liked it... In retrospect, I can say, 'Good for us'." "Greenlight was a pre-Kickstarter to us, marketing-wise but also to get feedback from the community... It was a fantastic marketing tool"
Schade can look back on the failure to land a publisher with positivity because it forced Rockfish to stay completely independent, and use Kickstarter to gauge interest and raise money. It helped, of course, that the team truly believed in its product, which combined a knack for fast gameplay and accessibility honed in mobile development with the roguelike element popular among core gamers. Schade, who focuses on marketing and PR for Rockfish, admits that he had "no clue on PC and console, whatsoever" at first, but having a game that truly excited him made the learning process quicker and easier. It also helped that Steam Greenlight still existed, a platform that could provide a skilled developer with "a million views for free" on the biggest distribution platform for PC gamers. "It was thumbs up, thumbs down, and if the game didn't look like utter garbage you get your thumbs up," he recalls of the service Valve shut down a year ago. "The most difficult thing is getting that visibility... You don't get that initial ramp up any more. "It also helped us to run a successful Kickstarter. We used Greenlight first; to work on our pitch and make the pitch for our Kickstarter better, to collect addresses, sign people up for our newsletter. For us, that worked really well. Greenlight was a pre-Kickstarter to us, so to speak, marketing-wise but also to get feedback from the community... It was a fantastic marketing tool." Schade laments the death of Steam Greenlight, and he admits that running a successful Kickstarter will be more difficult in its absence - particularly as a failed Kickstarter will cause developers "a very big problem" when attempting to find a publisher or secure financing later on. Rockfish had no such issues, though, raising €420,000 from almost 11,000 backers in August 2015. From that point, Schade set about finding ways of drawing more people to Everspace, steadily building its audience from those 11,000 Kickstarter backers. It is clear that - the oft-cited need for a good game aside - persistent and attentive marketing has been absolutely essential to the progress made in the two years since then. That includes the bewilderingly detailed approach to Facebook described in the introduction of this article, and the striking reach of platforms like Imgur and Reddit that Schade outlined in a talk at Ludicious 2017 - 16 million views for a series of animated GIFs that cost nothing to produce. Schade describes a game by another developer at GIC; a game he clearly admires, but one made by a team with no knowledge of how to raise awareness, how to build an audience, how to gain that all-important visibility. "To me that's not a surprise, because there's eight of them and they're all developing on the game," he says. "At Rockfish, my partner [Christian Lohr] runs the studio and I take care of marketing and sales. I'm not part of that core development team, but I can take care of all the marketing and PR stuff." Schade engaged (and continues to engage) with these platforms on a weekly, sometimes daily basis, slowly building a picture of how best to make use of each one. Indeed, Schade describes the process of building Everspace's community as one of constant revelation; dozens of small, essential observations that can only come from constantly poking and prodding platforms like Imgur, Reddit and Facebook. Twitch is a perfect example, he says, its combination of gameplay, video and rapidly scrolling chat-stream immediately confusing, but impossible to ignore because Rockfish's Kickstarter backers were already streaming its game. "Then we had the connection. I saw how passionately streamers played our game, and talked about our game," he says. "Slowly, I got what it was all about." Schade started watching every stream he could, announcing that the development team was in the chat and inviting questions from the audience. Rockfish then selected a handful of "best pilots" and gave them free Steam Early Access keys (where Everspace launched in September 2016) to gift to their viewers. "I've been running my own studio for the last 24 years, and this is the first time we're truly independent - by definition"
"Doing that very selectively made each one special, and that drove a lot of traffic to them [the streamers]," he says. "We worked our way up from streamers with 50 or 100 viewers to, when Everspace hit full release, with CohhCarnage. In the morning he played PlayerUnknown's Battlegrounds, with 12,000 people watching, then he played Everspace. We were on the frontpage of Switch. It was fantastic. I couldn't reach out to him directly, but I found out who his mods were and continuously gave them keys, to keep him streaming it." At Ludicious, Schade emphasised constant presence as a key to effective marketing for indies. "If something goes viral you don't go to sleep," he said. "If a question comes up [from the US west coast] you have to answer it immediately. If you answer the next day the crowd has gone." He reiterates the same point now; opportunities like this are there for any developer, but you'll never find them if you aren't looking. "You have to see them," he adds, "and then you have to do the right thing." Everspace launched on the Xbox Preview Program and Windows 10 UWP at the same time as Steam Early Access, all part of the drive to increase the profile of the game as much as possible. It was a lot of work, Schade admits, with a huge amount of development going on across a very busy six months. "But then again we get all of that visibility," he says. "It's not like you see a game and then immediately buy it; you buy a game because you see it a couple of times, you have a continuously positive impression, and sooner or later it's at a price you're willing to pay and you go for it... The UWP, Xbox Game Preview stuff was a lot of effort, it put us under pressure, but in the end I think we got that right." Indeed, Everspace received "six-digit figure downloads" in the space of two months in Xbox Preview, not to mention giving the team some valuable console experience that will feed into a "very polished" PlayStation 4 version that will launch this year. And with every step Everspace has grown in popularity: 11,000 copies were tied to Kickstarter donations across 30 days, 30,000 copies were sold in the first month on Early Access, and that jumped to 40,000 units in four weeks when it officially launched in May 2017. On Steam, Schade says, Everspace is now sitting on 400,000 different wish-lists, double the amount on the day that it left Early Access. When Schade says "we can sell a few more" he means it, and if that happens it won't be because of a roll of the dice. "We're very confident for our next beat, for the expansion that's coming, for future sales. We're going to be fine. It gives you a lot of confidence," he says. "I've been running my own studio, with my partner and the team, for the last 24 years, and this is the first time we're truly independent - by definition. "We do only what we think is right for the game, we self-publish, and financially we don't have any investors on an equity basis. We're even in a comfortable situation where we can fund a junior team working on a new title - which won't be a space game, for a change." I was one of those producers that liked it at GDC 2015. Congratulations on the success, and I'm glad you made it to Xbox in the end!